Are you looking for a special gift for a bridge player? 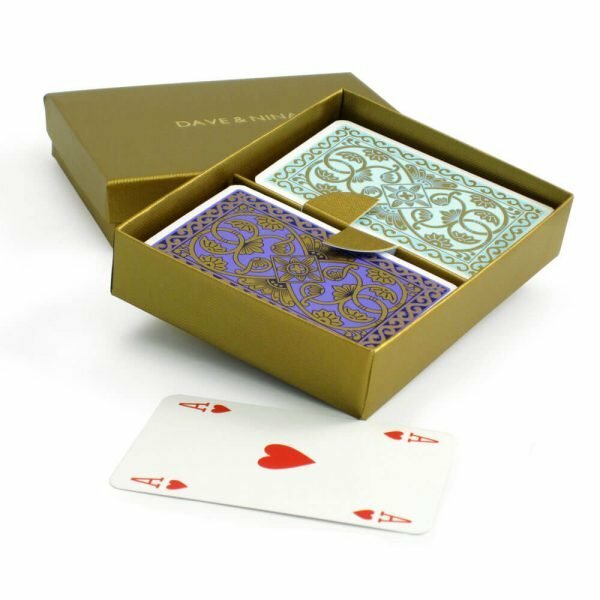 Our Decorative Twin Pack of Bridge Playing Cards – Personalised Box, gives you just that. We have put together a collection of our most popular designs of decorative bridge cards. The cards are top-quality. We’ve handmade elegant gold buckram presentation boxes and left the lids blank ready to be foiled with your own personalised special wording. All the boxes are handmade in our Devizes workshop. With a wide choice of card designs, we’re confident that there’s a double pack that’s just right for you. Choose your design of cards, then tell us what you’d like printed on the lid of the box. You can have the lid initialled or customised with your own personal message, date, initials etc. On these gold boxes we use gold foil for the personalisation. The font we use is Gill Sans in capital letters. Each letter or character is picked from our collection of brass type and set by hand so the longer your word, the more time it takes us to produce. For this reason we charge on a per character basis. We are renowned for the quality of our playing cards, and we have an in-house grading system. All of the collection of cards in the Decorative Twin Pack of Bridge Playing Cards – Personalised Box range are either Superior or Premium Quality so you can buy with complete confidence. Read more about the different qualities of playing cards and our grading system. We can personalise the boxes with your company or club logo in any size, position and colour. For medium size orders we can make bespoke boxes for you in a style and covering of your choice. For the larger orders we can even produce bespoke playing cards that are unique to you. Please contact us with details of your project and we can discuss the options. We’ve worked with some large and luxury brand names and really enjoy bespoke projects so we look forward to hearing from you!